The collectin surfactant protein-A (SP-A) is involved in the innate host defense and the regulation of inflammatory processes in the lung. In this work we investigated the molecular mechanisms related to the immunostimulatory activity of SP-A using macrophages from C3H/HeJ mice, which carry an inactivating mutation in the Toll-like receptor (TLR)4 gene, and TLR4-transfected Chinese hamster ovary cells. We demonstrate that SP-A-induced activation of the NF-κB signaling pathway and up-regulation of cytokine synthesis such as TNF-α and IL-10 are critically dependent on the TLR4 functional complex. These findings support the concept that TLR4 is a pattern recognition receptor that signals in response to both foreign pathogens and endogenous host mediators. Early interest in pulmonary surfactant focused on the biophysical properties of the phospholipid components, especially their ability to lower surface tension at the air-epithelial interface within the alveoli. However, there are also proteins associated with the surface-active material. The most abundant among them, surfactant protein-A (SP-A),3 is a member of the collectin family of preimmune opsonins, which also includes surfactant protein-D, mannose-binding protein, conglutinin, and collectin-43 (1, 2). Recent studies suggest an integral role for SP-A in innate host defense and regulation of inflammatory processes in the lung. Although several studies have demonstrated that SP-A enhances macrophage chemotaxis, phagocytosis, immune cell proliferation, and expression of cell surface proteins, the role of SP-A in regulating production of cytokines is controversial (3, 4, 5, 6, 7, 8, 9). Regardless, the observation that SP-A can mediate cell-specific functions suggests the existence of specific receptors. Although a number of SP-A binding proteins have been identified, their contributions to the biological activities of SP-A remain debatable (4). In that context, it is of interest to note that the immune responses induced by SP-A are similar to those observed when cells are stimulated by bacterial LPS (10). For instance, it has been shown that SP-A activates the major downstream signaling NF-κB pathway and that specific NF-κB inhibitors block SP-A-dependent increases in TNF-α mRNA levels (11). Based on these data, we hypothesized that SP-A and LPS may share a common functional receptor. According to the current model, the specific cellular recognition of LPS is initiated by the signal-transducing Toll-like receptor (TLR)4 and the accessory molecules CD14 and MD-2, leading to the rapid activation of intracellular signaling pathways, which coordinate the induction of multiple genes encoding inflammatory mediators (12, 13). TLRs appear to represent a conserved family of innate immune recognition receptors. A variety of bacterial and fungal products have been identified that serve as TLR ligands, but TLRs may also regulate homeostasis via interaction with endogenous protein ligands (14, 15, 16, 17). In the present study, we demonstrate for the first time that SP-A requires a functional TLR4 complex to induce leukocyte activation. LPS (Escherichia coli 055:B5), PMA, 4α-phorbol didecanoate, and Gey’s medium were from Sigma-Aldrich (St. Louis, MO). RPMI 1640 medium, HBSS, antibiotics, and glutamine were from Life Technologies (Paisley, U.K.). FCS was from HyClone Laboratories (Logan, UT). Non-phosphothioate-modified oligodeoxynucleotide (ODN)1668 was custom synthesized by Genset (Paris, France). The immunostimulatory oligonucleotide sequence was 5′-TCCATGACGTTCCTGATGCT-3′ and the inactive control was 5′-TCCATGAGCTTCCTGATGCT-3′. Human SP-A was isolated from the lung washings of a patient with alveolar proteinosis by a modification of a protocol of Suwabe et al. (18), which included serial sedimentation of the surfactant pellet in the presence of 1 mM Ca2+, elution with EDTA, and adsorption to mannose-Sepharose. For some experiments, SP-A was further purified by gel filtration under physiologic ionic strength conditions (150 mM NaCl, 10 mM Tris) by Superose 6 gel filtration chromatography using a fast protein liquid chromatography column with a bed volume of 10 × 300 mm (Amersham Pharmacia Biotech, Piscataway, NJ). The level of LPS associated with the SP-A was 140 pg LPS per microgram of SP-A. Another SP-A preparation was obtained having no detectable LPS using the QCL1000 kit (BioWhittaker, Walkersville, MD). Five- to 6-wk-old female C3H/HeOuJ or C3H/HeJ mice provided by Iffa Credo (L’Arbresle, France) and Institut Pasteur (Paris, France), respectively, were used to prepare bone marrow-derived macrophages (BMDM), as previously described (19). Briefly, mice were euthanized by CO2 exposure and femurs were aseptically collected and placed in cell culture dishes containing sterile HBSS. Bone marrow was collected with HBSS and RBCs were lysed with Gey’s medium. The cell suspension was then centrifuged and the pellet was resuspended in RPMI 1640 medium supplemented with 10% FCS and 10% CSF-1-conditioned medium. Cells were then cultured for 3 days. Nonadherent cells were removed and centrifuged for 10 min at 400 × g. The pellet was resuspended in 1 ml of RPMI 1640 supplemented with 10% FCS and 1% antibiotics. Cell suspension was flushed through 25-, 27-, and 30-gauge needles successively to separate cell aggregates. Cells were resuspended at 2 × 106 cells/ml in RPMI 1640 supplemented with 10% FCS, 2.5% CSF-1-conditioned medium, and 1% antibiotics. A total of 300 μl of the cell suspension was dispensed into 48-well tissue culture plates (Costar, Corning, NY). After an overnight incubation, wells were washed with prewarmed medium and stimulated as indicated in the figures. The promonocytic U937 cells were obtained from the American Type Culture Collection (Manassas, VA) and grown in RPMI 1640 supplemented with 10% FCS, 1% antibiotics, 1% glutamine, and 10 mM HEPES. Cells were dispensed into 48-well plates (Costar) at 1.7 × 106 cells/ml and differentiated into macrophages in the presence of 15 nM PMA or 15 nM 4α-phorbol didecanoate as a negative control for 48 h at 37°C in a 5% CO2 humidified air atmosphere. Then, adherent cells were washed with medium and 300 μl of prewarmed medium was dispensed into each well. Twenty-four hours later, cells were washed and stimulated as indicated in Results. Murine TNF-α and IL-10 concentrations in BMDM supernatants were determined by an ELISA and a solid-phase immunoenzyme assay as previously described (19), respectively. Human TNF-α concentrations in the supernatant of U937 cells were determined by ELISA, according to the manufacturer’s protocol (Pelikine compact; CLB, Amsterdam, The Netherlands). The Chinese hamster ovary (CHO)/CD14/TLR4 reporter line is a stably transfected human CD14- and TLR4-positive CHO cell line that expresses inducible membrane CD25 under the transcriptional control of the human E-selectin promoter (13, 20). The promoter fragment chosen contains an essential NF-κB binding site. Flow cytometry analysis of NF-κB activity used cells that were plated in 12-well dishes and stimulated in Ham’s F12 medium containing 10% FCS, as indicated in Fig. 2⇓. Subsequently, the cells were harvested with trypsin-EDTA and labeled with FITC-CD25 mAb. Fluorescence analysis was performed using a FACScan flow cytometer (BD Immunocytometry Systems, Mountain View, CA). Binding of anti-CD25 Ab to its epitope is expressed as the fold increase in median fluorescence intensity over basal values measured on nontreated cells. Each point corresponds to the mean ± SD of the indicated number of experiments. Statistical significance between the individual groups was analyzed using the unpaired Student t test with a threshold of p < 0.05. A growing number of reports have suggested that SP-A may have some host defense-related properties (3, 4). We first sought to characterize the effect of purified SP-A on murine BMDM, in terms of cytokine production. Supernatants from BMDM cultured in the absence or the presence of increasing concentrations of SP-A (2.5–20 μg/ml) were harvested after 6 or 24 h and assayed for TNF-α and IL-10 concentrations, respectively (Fig. 1⇓). For comparison, BMDM were also activated by an optimal concentration of LPS (1 μg/ml). 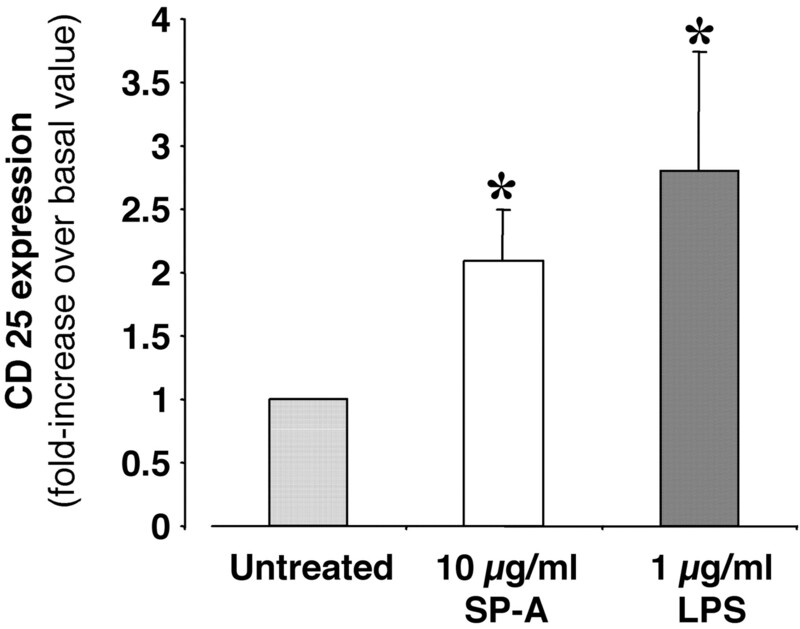 To rule out any possible effect associated with contamination of SP-A by LPS, all experiments performed during this investigation used SP-A supplemented with 20 μg/ml polymyxin B, a well-characterized LPS inhibitor (21) (Fig. 1⇓). Under these experimental conditions, TNF-α and IL-10 levels increased to levels of up to ∼250 and ∼3500 pg/ml upon exposure of BMDM with a concentration of SP-A above 10 μg/ml, respectively (p < 0.001; n = 4). LPS elicited a stronger immunostimulatory effect that was about twice that measured upon SP-A cell activation (Fig. 1⇓). Experiments were also performed to determine the effect of SP-A on the secretion of cytokines from human cells. The undifferentiated human U937 monocytic cell line failed to up-regulate TNF-α release in response to 10 μg/ml SP-A or 1 μg/ml LPS. However, when U937 cells were cultured with PMA, which promotes differentiation to a more macrophage-like phenotype (22), this cell line became responsive to both stimuli. Thus, TNF-α levels were 482 ± 70 and 1259 ± 26 pg/ml upon SP-A and LPS treatment, respectively (p < 0.001 when compared with resting cells; n = 3). Denaturation of SP-A by boiling reduces this activity by ∼95% (data not shown). The heat-sensitive nature of SP-A as well as the failure of polymyxin B to inhibit its stimulatory effect indicates that SP-A-induced cytokine secretion from macrophages is LPS independent. Because purity of the natural SP-A is critical to the interpretation of these experiments, we also assessed the immunostimulatory activity of SP-A that was further purified by Superose 6 gel filtration chromatography (6 million m.w. cut off), a method that excludes lower and high molecular components such as surfactant protein-D. Upon incubation of BMDM with 10 μg/ml of the purified SP-A in the presence of 20 μg/ml polymyxin B, TNF-α levels increased up to 264 ± 49 pg/ml (n = 3). This value is consistent with the TNF-α release (263 ± 51 pg/ml; Fig. 1⇓A) observed in supernatants of BMDM treated with SP-A purified using the modified protocol of Suwabe et al. (18) alone. SP-A stimulates murine macrophage cytokine secretion. BMDM from C3H/HeOuJ mice were stimulated by LPS (1 μg/ml) or increasing doses of SP-A (2.5–20 μg/ml), in the presence (+) or absence (−) of 20 μg/ml polymyxin B sulfate. After 6 or 24 h, BMDM supernatants were collected and TNF-α (A) and IL-10 (B) concentrations were determined by ELISA, respectively. ∗, Values are significantly different from nontreated cells (p is <0.05). Results are expressed as the mean ± SD and are representative of four distinct experiments performed in triplicate. Based on the common ability of SP-A and LPS to induce NF-κB-dependent signals leading to similar immune cell responses, we hypothesized that SP-A and LPS may share a common stimulatory pathway. In that context, we evaluated whether SP-A could be an endogenous ligand of the TLR4 complex. Thus, we determined whether SP-A could activate TLR4 in a CHO-K1 cell line transfected with expression plasmids for TLR4 and CD14, and the reporter construct NF-κB-dependent pELAM1-CD25. This cell line was challenged with 10 μg/ml LPS-free SP-A supplemented with polymyxin B or with 1 μg/ml LPS as a positive control. SP-A induced a significant CD25 expression (p < 0.01, n = 3) that was ∼70% of the LPS response (Fig. 2⇓). In comparison, 10 μg/ml SP-A did not induce any NF-κB-dependent CD25 expression in a control cell line that was not transfected with TLR4 and CD14 expression plasmids. By contrast, this control cell line was strongly responsive to 50 ng/ml murine IL-1β, under the same experimental conditions (CD25 expression was increased 6.3 ± 0.5-fold over basal values measured on resting cells; n = 3; p < 0.01; data not shown). SP-A activates the NF-κB signaling pathway through TLR4. CHO-K1 cells transfected with expression plasmids for human TLR4 and human CD14, and the reporter construct pELAM1-CD25 were stimulated by LPS (1 μg/ml) or SP-A (10 μg/ml). After 24 h, CD25 expression was determined by flow cytometry. Results are expressed as the fold increase in median fluorescence intensity over basal value measured on nontreated cells. ∗, Values are significantly different from nontreated cells (p is ≤0.05). Results are mean ± SD of three distinct experiments. SP-A-induced cytokine secretion was analyzed using BMDM isolated from the LPS nonresponsive C3H/HeJ mice, carrying an inactivating mutation in the tlr4 gene (23). We compared this effect to that observed using BMDM isolated from C3H/HeOuJ mice, a genetically related but TLR4-sufficient murine strain. Strikingly, SP-A-induced IL-10 secretion was markedly reduced in TLR4-deficient BMDM, in comparison with control BMDM (270 ± 164 vs 2079 ± 131 pg/ml; n = 3; p < 0.001; Fig. 3⇓). A similar pattern was observed when TNF-α secretion was examined (data not shown). The BMDM from C3H/HeJ did not appear to be globally refractory to inflammatory stimuli, because cell activation was not reduced when BMDM were challenged with a specific TLR9 ligand, i.e., ODN1668, a CpG ODN derived from a mycobacterial sequence (24). As expected, the corresponding nonactive ODN did not trigger any cytokine secretion (n = 3, Fig. 3⇓). Cytokine production by SP-A-stimulated macrophages is TLR4 dependent. 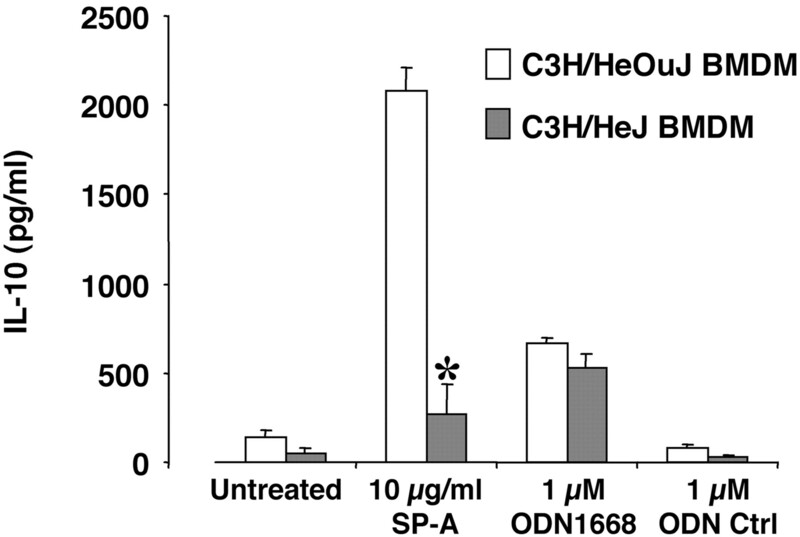 BMDM from C3H/HeOuJ and C3H/HeJ mice were stimulated by SP-A (10 μg/ml) and the CpG ODN1668 and the corresponding control ODN (ODN Ctrl, 1 μM). ∗, Value is significantly different from wild-type BMDM (p < 0.001). Results are expressed as the mean ± SD and are representative of three to four distinct experiments performed in triplicate. The lung is protected by innate and adaptive immune mechanisms as well as by a unique local immunoregulatory system, i.e., pulmonary surfactant. Surfactant modulates several inflammatory processes including cell proliferation and the release of inflammatory mediators. The lipid components of surfactant appear to have predominantly immunosuppressive effects, but the hydrophilic surfactant protein, SP-A, has been reported to exhibit both immunostimulatory and immunosuppressive activity (25). Thus, in vitro studies by McIntosh et al. (5) and Sano et al. (6) suggest that SP-A can inhibit LPS-induced TNF-α production by alveolar macrophages. These results, which are contradictory with previous data, may be explained by the primary activation state of these leukocytes (7) and/or the method of SP-A purification. A role of SP-A in the down-regulation of pulmonary inflammation has also been suggested using mice deficient in this protein, which have increased inflammatory cytokine in response to an infectious insult compared with wild-type mice (8, 9). However, it is of note that this anti-inflammatory effect of SP-A is not observed in a murine model of sepsis-induced lung injury (26). In this work we investigated the effect of human SP-A on the production of cytokines by two well-defined populations of human and murine macrophages. We show that SP-A, at a concentration likely to be found in the alveolar spaces (11), induces the secretion of immunoregulatory molecules such as TNF-α and IL-10. These observations suggest that, under normal in vivo conditions, the inhibitory effects of the lipids prevail. However, in some lung diseases or after certain insults, the balance between the inhibitory and stimulatory influences may be disrupted and result in inflammatory injury (27). In that regard, an increased level of SP-A has been found in pulmonary lavages from patients with pneumonitis, asbestosis, or exposure to hyperoxic conditions. Interestingly, these pathological conditions are characterized by elevated levels of cytokines and the presence of an inflammatory state (28). One could speculate that these changes are the result of an increased level of SP-A. During the course of our study, we compared SP-A- and LPS-induced immunostimulatory activity and found that both mediators stimulate the expression of the same cytokines. LPS contamination could not account for SP-A effects because the neutralizing molecule polymyxin B was systematically added to all SP-A samples and the protein denaturing heat treatment suppressed SP-A activity. In addition, LPS-free SP-A was efficient in activating the NF-κB signaling pathway through TLR4. The finding that SP-A induces cell-specific functions led to the search for its functional receptor. Kuroki and colleagues (29, 30) recently reported that SP-A binds to both CD14 and TLR2 and that this interaction likely contributes to the ability of SP-A to affect LPS- and peptidoglycan-mediated cell responses, respectively. CD14 lacks an intracellular domain necessary for signal transduction and is believed to present various pathogen-associated molecular patterns to signal-transducing molecules of the TLR family (15). Although SP-A may directly bind to the extracellular domain of TLR2, it does not induce activation of the major downstream signaling NF-κB pathway (29). Our data indicate that SP-A-induced activation of the NF-κB pathway and up-regulation of cytokine synthesis are strongly dependent on a TLR4 functional complex. Although the detailed mechanism by which SP-A interacts with this receptor remains to be determined, the results presented in this work argue that TLR4 is a pattern recognition receptor that signals in response to both foreign pathogens and host endogenous mediators. This finding is consistent with recent studies showing that fibrinogen and heat shock protein 60 are putative ligands of the TLR4 complex (16, 17). In summary, the data presented in this report demonstrate that cell activation by the lung SP-A is mediated by TLR4 and support the concept that SP-A may be an important mediator of inflammation. ↵1 L.G. was supported by the Délegation Générale pour l’Armement (Paris, France), M.S.-T. was partly supported by Vaincre la Mucoviscidose (Paris, France), and D.T.G. was supported by National Institutes of Health Grant GM54060. ↵3 Abbreviations used in this paper: SP-A, surfactant protein-A; TLR, Toll-like receptor; BMDM, bone marrow-derived macrophage; ODN, oligodeoxynucleotide; CHO, Chinese hamster ovary.